Near Unison, my project exploring harmonographic traces is currently being shown at Kinetica Art Fair. The exhibition is in Ambika P3, the exhibition space attached to the University of Westminster on Marylebone Road. For more information on the exhibition, and details about tickets and opening times please visit the Kinetica Art Fair website. 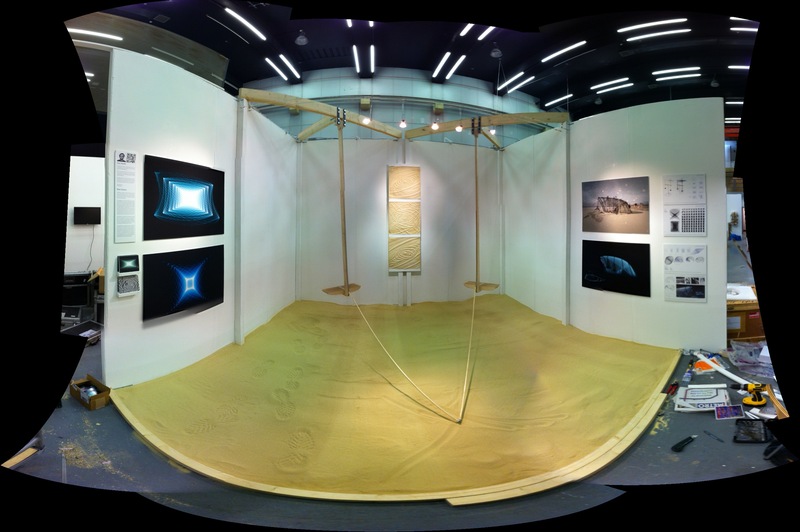 The exhibit features a prototype of the interactive harmonograph swings that could form part of the larger installation proposed for Burning Man Festival, along with casts of the harmonographic traces left in sand, and photographic work documenting the process. “The 5th Kinetica Art Fair returns February 28th – March 3rd 2013 at Ambika P3, as one of London’s annual landmark art exhibitions and a permanent ﬁxture in the Art Fair calendar, renowned as the UK’s only art fair dedicated to kinetic, robotic, sound, light, time-based and new media art. Kinetica is hosting the work of over 45 galleries and art organisations nationally and internationally, with representatives from UK, France, Russia, USA, Poland, Holland, Spain, Italy, Hungary, Indonesia and Japan, collectively showing over 400 works of art. NEAR UNISON is an installation that allows participants to visualize the harmonic relationships between them. Pairs of sit-on pendulum swings create several large scale harmonographs that scratch drawings onto the surface of the Black Rock Playa. The structure that holds these harmonographs is itself a physical representation of a harmonographic form that can be seen from a distance across the Black Rock Playa. The harmonograph was a 19th century machine that was invented to explore the geometry of sine waves. It was soon developed into a popular parlour room toy that was capable of producing beautiful and delicate drawings simply by mapping the relationship between two swinging pendulums. By changing the lengths of the pendulums, their wavelength and oscillating frequency are changed. When the ratio of these two frequencies is something complex like 35:73, there is no discernible pattern, but as soon as it hits a simple ratio such as 3:5 or 2:3 a clear pattern emerges. The relationship between visual harmony and mathematical ratio is exactly the same those found in musical harmonies: the ratios that produce beautiful drawings are the same as produce harmonious musical chords. The title ‘NEAR UNISON’ is derived from the set of patterns that occur when the ratio of the two pendulums is very close to 1:1, as will occur when people of a similar weight are using the interactive harmonograph. It is expected that the patterns produced by these interactive harmonographs will describe, in an abstracted manner, the similarity of all human beings, while emphasizing the subtle differences between individuals. The overall form of the structure is also derived from a 3D harmonographic surface with a ratio that is in this ‘near unison’ region. A plywood structure supports pipes that trace the harmonographic lines through space to create a delicately curved sculptural form that sits directly on the Playa. Suspended from this structure are a series of connected pendulums that participants are able to ride like swings. When they are are used, these pendulums trace harmonographic patterns onto the surface of Playa. The drawings that are created will map the interaction between pairs of participants. A series of long exposure photographs of a light on the end of a freely oscillating pendulum. The pendulum’s centre of gravity is slightly off-centre, meaning that the x and y components of its movement oscillate at very slightly different frequencies; the harmonic relationship between these frequencies causes remains constant as the amplitude decreases due to friction between the pendulum and the air. This set up is the most simple form of a harmonograph. Last year we saw Jack Munro making use of the DAVID 3D Laser Scanner software to scan his sand cast. Although home-made, this scanner requires a laser and about £300 of software. Autodesk 123D Catch is a free piece of software that allows the user to create a 3D scan [imports into Rhino as a mesh] using only a set of normal photos. It is also available as an app for the iPhone meaning that you can take the photos and upload them at the same time. All of the image processing is done on Autodesk’s servers. The video above uses the LinceoRV augmented reality software to show a comparison between the real object and its digital mesh counterpart. The resolution depends on the number of photos, position of photos, background, lighting conditions, etc, but the scan depicted appears to have a resolution of about ±2mm on a 120mm wide object. While trying to figure out useful ways to interact with some wire frame models of 3D Harmonographs, I started exploring some examples of augmented reality software that allows a 3D mesh model to be tracked to a physical marker. The two pieces of software experimented with were the AR Plugin for Autodesk Showcase and LinceoRV. Both are stand-alone render/presentation engines with an augmented reality mode. I found the Showcase AR Plugin to work well with pre-recorded footage, but not accept my live webcam feed, and LinceoRV to work much better with the live feed, but be more limited on the types of marker that it accepted. Both pieces of software can handle multiple markers. The software basically analyses a binary [black and white] feed from the film, recognises the marker symbols, and works out their distortion due to perspective. It then uses this distortion to accurately recreate the camera position in relation to the digital model. Using the LinceoRV software could be an useful way to present/manipulate 3D models that are too challenging/costly to print. This example shows an animation of my ‘work-in-progress’ Grasshopper definition that uses Hoopsnake to recursively perform a ‘copy by mirror’ function on a geometric form. The two examples are based on a cube and a tetrahedron. The growth is linear; expanding by one module with each step. The position of each new module is determined by a new randomly selected face of the preceding module. I would like to develop the definition so that it doesn’t self intersect, so any comments with ideas on how to achieve this would be appreciated!